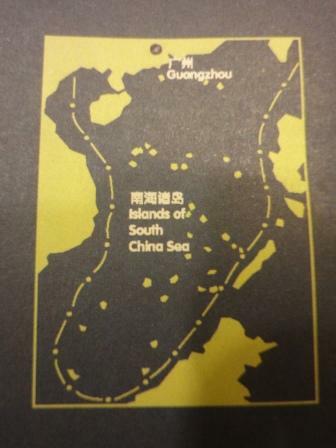 The other day, in the midst of a long flight on China Southern Airlines, I turned – as I like to do – to the in-flight magazine. Nihao is actually better than most and, after losing myself in a brief essay on the nature of time (I’m not kidding), I flipped to the back, and the maps, where I came across this curious map – and sub-map, in the lower right corner – showing the airline’s domestic Chinese services. A banking advertisement you won’t see at US airports. 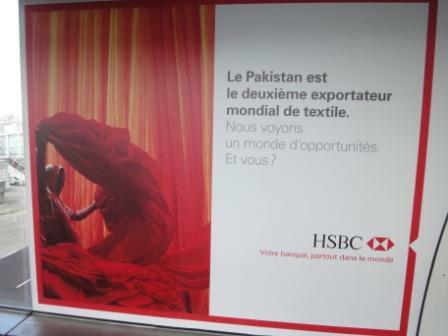 For my non-French speaking readers, the caption reads: Pakistan is the world’s second largest textile exporter. We see a world of opportunities. And you? Needless to say, this advertisement is pretty much unthinkable in a US airport, and that underlines for me the unfortunately black-and-white understanding of Pakistan (Pakistan = scary Muslims) that seems to prevail in the US, stoked – in large part – by a mainstream media that seems determined to cover the country as a conflict zone, solely, rather than as something more nuanced and complex. Of course, parts of Pakistan are conflict zones – but presumably there’s very little overlap between those parts, and the parts that make it a major textile exporter. It’s be nice to see more coverage of the latter, in part as a primer on how to deal with the latter. 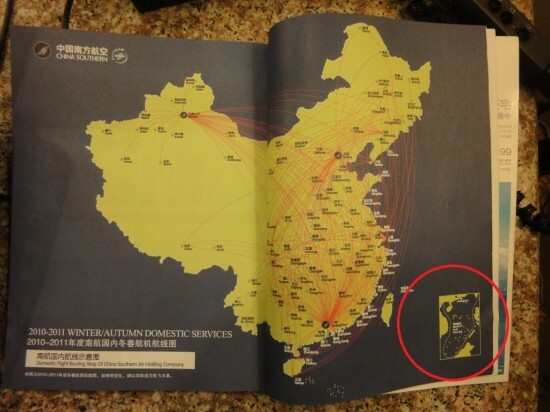 Of course, I could be wrong, and this ad is running in English all over US airports. If so, please let me know. I spent much of the last two weeks in India, and the one that I’m going to share with my readers is a sign that I found in the brand spanking new, much vaunted, Terminal 3, at Indira Gandhi International Airport (the rest of that trip shall remain shrouded in secrecy, occasionally broken on twitpic). Opened in mid-July, the new DEL is – on the surface, at least – a significant upgrade on the old DEL, which – famously – was often compared to a bus station. The place was a dump. That’s right: a sign prohibiting foreigners from exchanging money in the airport. Or, more specifically, a sign prohibiting foreigners from exchanging money past security. So, in other words, if you’ve cleared security and you still have a wallet full of rupees, you either are going to have to exchange them wherever you’re going, or dump them in the very small handful of concessions operating in Terminal 3. What makes it more irritating, if not offensive, is that Indian passport holders – they can exchange money. 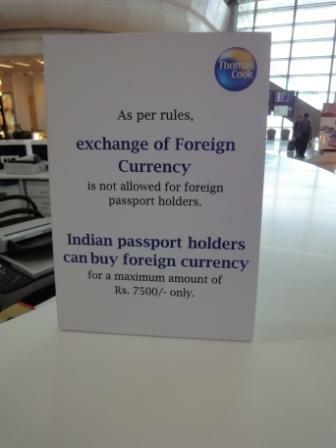 I’m guessing that there’s a commercial motive behind this “rule,” and if so, I’d like to go on record as saying that refusing foreign exchange so that visitors feel compelled to unload their rupees in crappy airport shops is, to put a fine point on it, very bus station-like. But perhaps I’m off on this? Are there other major international airports out there which preserve the right of foreign exchange only for native passport holders? 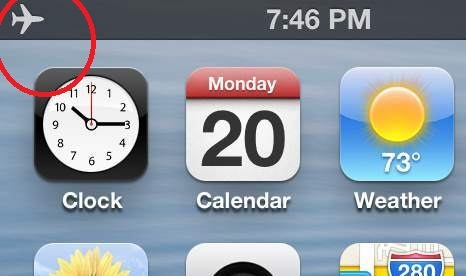 Is there a perfectly good, perfectly reasonable, explanation for this rule that I’m missing? Comments are open. As the flight ascended, the knife descended. The other morning, as my flight ascended into the sky over a major Asian airport, I felt something hard fall to the floor beside my feet. Curious, I leaned forward and saw, on the floor, something that I initially mistook as a piece of the seat in front of mine. 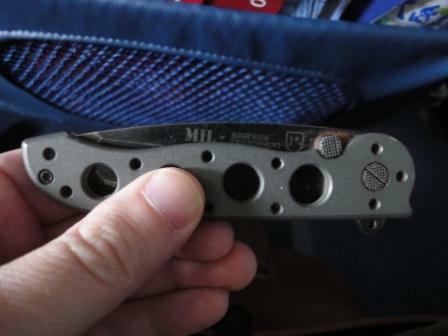 I picked it up, turned it in my hand and realized that – rather than holding a loose part – I was actually in possession of a quite serious 3.5 inch (89 mm) knife. Below, a photo of the sheathed weapon.